Caoimhin Reilly reports from Oriel Park. 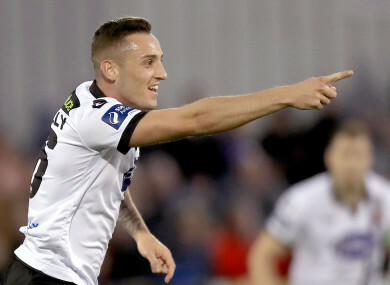 DUNDALK MADE IT to the semi-finals of the Irish Daily Mail FAI Cup for the fourth time in five seasons with a 4–0 drubbing of Drogheda United at Oriel Park tonight. First-half goals from Michael Duffy and Dylan Connolly – who netted in stunning style – had the tie all but wrapped up by the break, before Brian Gartland and David McMillan (penalty) struck in the second-half to complete the rout. Duffy gave Dundalk the lead after only five minutes. A mix up in the Drogheda defence saw the winger nip in and drive past Stephen McGuinness from six yards with Shane Elworthy and Dave Mulcahy left to rue their slack defending. The one-way traffic continued until Connolly scored the goal of the game on 28 minutes. Having registered his first goal for the club in last Friday’s victory over St. Patrick’s Athletic, Connolly doubled his tally with a sweetly struck right-footed drive to the top-corner of the net, leaving McGuinness with no chance. Drogheda’s closest opportunity had come in the opening two minutes of the match when Gary Rogers was forced to tip over Adam Wixted’s dipping effort. Pete Mahon introduced Stephen Elliott to his attack for the second half as the Boynesiders looked for a way back into the game. However, Brian Gartland’s fourth goal of the season put the game to bed as the centre-half headed Duffy’s free-kick to the net four minutes after the break. And it was 4-0 before the hour mark when David McMillan converted a penalty past McGuinness after referee Neil Doyle adjudged Conor Kane to have shunted Connolly over inside the area – a decision which the visiting defender vigorously denied. A Luke Gallagher shot which cracked the crossbar was the closest the Drogs came to a consolation, and it could’ve been a lot worse for the visitors. Stephen Dunne cleared two Dundalk efforts off the line while Kane also avoided an ‘own goal of the season’ contender when his miscued clearance came back off the woodwork. Email “Dylan Connolly's strike the pick of the bunch as Dundalk's FAI Cup pedigree continues”. Feedback on “Dylan Connolly's strike the pick of the bunch as Dundalk's FAI Cup pedigree continues”.